Let us help you educate your family, friends, neighbors and community leaders about recycling. We can bring our “Wheel of Recycling” or “What Bin Does It Go In” games to test your knowledge of what’s recyclable. We can also provide a more formal recycling presentation for meetings or events as well. Want to see what events we will be attending? Check out our upcoming events calendar! We can speak at your neighborhood or community meeting, give a presentation to your group members and provide handouts of recycling information. We love attending community events. 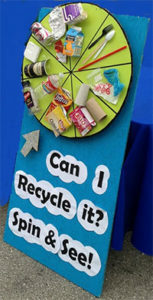 We can staff an information table, bring our Recycling Wheel-O-Fun and provide flyers and handouts to help your attendees learn about recycling. Yes, I Want Saint Louis City Recycles To Attend My Meeting or Event! Find upcoming recycling events in St. Louis.